Dreamforce ’14 is right around the corner! To gear up, we’re giving you the lowdown on some of the most exciting Dreamforce keynote speakers and events going on at this year’s conference (also see Neil Young , Max Levchin & Marc Andreessen). Today, get to know keynote Jeremy Stoppelman with these 8 fast facts! 1. Jeremy Stoppelman is best known as the CEO of Yelp, an online site that offers word of mouth reviews of local businesses. He was also an early employee of X.com, which was rebranded as Paypal. 2. The idea for Yelp was hatched in 2004 when Stoppelman and his partners were attempting to come up with the “the next big internet idea.” They saw a phone book sitting on the table and realized there was nothing like it yet on the internet. So they built the site, added a word of mouth review component, and the idea took off. 4. Stoppelman turned down a bid from Google to buy Yelp, citing a desire to remain independent and focused on the growth of the company. 5. Joining Salesforce.com founder Marc Benioff, Stoppelman is a major contributor to the UCSF Children’s Hospital, which is known as the “connected hospital” for its use of cloud technology. He was joined at a recent UCSF fundraising event by will.i.am, MC Hammer and Colin Powell. 6. After formulating his idea for Yelp, Stoppelman dropped out of Harvard Business School to focus all of his energy on his new product. I assume this has not stopped the Harvard Alumni Association from calling for donations. 7. Stoppelman has a personal blog that hasn’t been updated since February of 2010. Despite being a little out of date, he offers some pretty interesting book reviews and shows off a sharp sense of humor. 8. In a recent reddit AMA, Stoppelman sarcastically listed his favorite Pop Tart flavor as “kale and whole wheat.” Someone get this man a brown sugar Pop Tart, stat! See the whole list of Dreamforce keynotes here, and make sure you visit our booth, located at Moscone N1123. We’ll be announcing exciting new product news, talking all things sales, marketing and tech, and will even have a putting a green where you can show off your skills and potentially win a great prize. 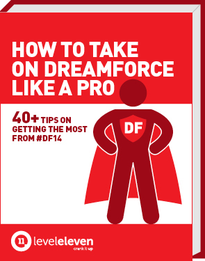 View our full Dreamforce schedule on this page — and don’t forget to check out our eBook with essential tips for doing Dreamforce like a pro. Click the cover below! Get to know Dreamforce keynote Jeremy Stoppelman with these 8 fast facts.